In 2010, back when I covered the border region for public radio, I visited a shelter for migrants, a modest building located a mile away, just south of the fence separating San Diego and Tijuana. There, recent deportees could find a bed for a few nights after Customs and Border Protection agents released them in Mexico. That’s where I met 34-year-old Verónica Vargas, a mother of two from Los Angeles, who’d been deported after a domestic violence incident. At the local jail, police checked both her and her husband’s immigration status and soon after, processed both for deportation. The couple’s youngest child, 7, remained under the care of their oldest, 18, back in their Los Angeles apartment. The stretch of land between Tijuana and San Diego was then — and is now — the most surveilled part of the 2,000-mile-long U.S.-Mexico border. Yet smuggling goes on anyway: People and drugs find new ways into the U.S., while guns cross in the opposite direction. Crossing illegally is increasingly dangerous and costly for everyone involved, but no amount of reinforcement can possibly stop this flow. Nor will political theater — including the kind that is paving the way for National Guard troops to be stationed at the border. Members of a caravan of Central Americans that spent weeks traveling across Mexico walk from Mexico to the U.S. side of the border to ask authorities for asylum. On April 29, 2018, more than 300 immigrants, the remnants of those that journeyed across Mexico, reached the border in Tijuana, Mexico to apply for legal entry into the United States. Last month, Defense Secretary James N. Mattis approved deploying up to 4,000 National Guard troops to “seal up our Southern Border,” as President Donald Trump announced on Twitter. Troops from California, Arizona, New Mexico and Texas would support U.S. Customs and Border Protection — without being permitted to arrest migrants or interact with them directly — through Sept. 30, 2018, which is when, in theory, Trump will have managed to come up with the funds to finally build his border wall. But here’s the thing: There is no such thing as a “crisis” at the border. What we are witnessing is a rise in the number of people seeking asylum in the U.S., and doing so without receiving due process. That includes the caravan of more than 1,100 Honduran migrants, most of them families with children, whose well-publicized trek to the U.S. prompted Trump’s call for the National Guard. 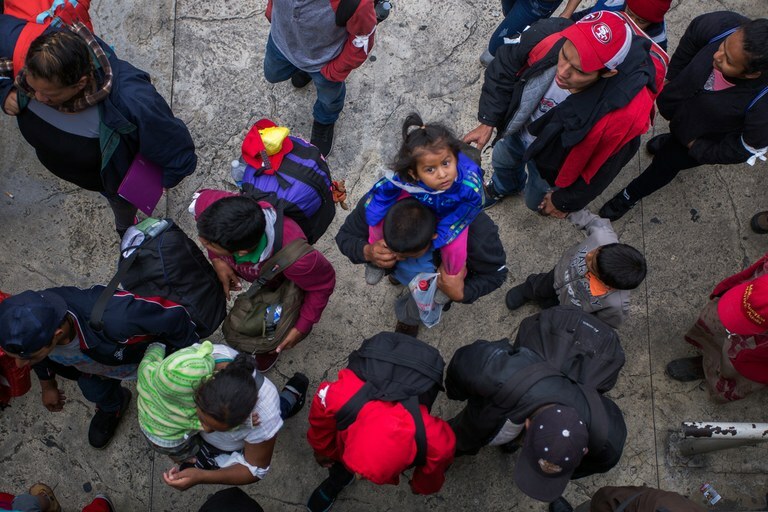 These migrants did not come to scale any walls; they came to ask for U.S. asylum at the border, as several dozen of them reportedly already have. Illegal crossings are currently at a 46-year low — down 71 percent in May 2017 from 2014’s peak, when Customs and Border Protection records show that it detained almost 69,000 people. So the extra troops are most likely unnecessary. But, as previous deployments demonstrate, they will be very expensive. In 2006, President George W. Bush stationed the National Guard at the border for two years at a cost of $1.2 billion. After the mission, Army National Guard Commander Maj. David M. Church said the Department of Homeland Security, which oversees CBP, had not communicated effectively with the Guard and gave him little time for preparation. Then, in 2010, President Barack Obama ordered a similar deployment to “help reduce drug and human trafficking.” That cost an estimated $110 million, and, according to the Government Accountability Office, the results did not justify the price tag. Back in January 2017, Trump signed an executive order that promised to make good on his campaign promise to build a wall, “monitored and supported by adequate personnel so as to prevent illegal immigration, drug and human trafficking, and acts of terrorism.” This was followed by more mandates targeting refugees and immigrants from Muslim-majority countries, undocumented immigrants without criminal records, and sanctuary policies, especially California’s. More than a year since that executive order, the $18 billion needed for Trump’s wall has yet to materialize. Meanwhile, we’re left with an increasingly isolated nation, one that is simmering with fear and anger, and ready to expel immigrants — mothers, children, asylum-seekers, Muslims — under the false narrative of chaos at the border.